At first blush, Reservoir Dogs does seem like kind of a weird choice for a video game. If you know anything about the Tarantino classic, it’s probably the movie’s defining gimmicks: that the film shows the “before” and “after” a heist, but not the “during”; and that as far as endings go, well, none of the filmmaker’s characters make it out of this particular movie unscathed. And of course, we all know the complete and utter lack of expectations that licensed games often face after so many failures. Sure, they’ve been a bit better as of late, but that’s not saying much. Lucky as they were to get the license and partner with Lionsgate, then, there are a lot of challenges facing relative newcomer Big Star Games as they pitch Reservoir Dogs: Bloody Days to gaming fans. And here’s another one, loath though I am to mention it — the comments on the game’s debut trailer, which currently sits at a grossly unfair 278 dislikes. “Heart dropped when I saw it was a top down shooter. Blatant cash grab. RIP,” says one commenter. “I don’t think they’ve even seen the movie,” says another. It’s this sort of inherent cynicism around indie games that disgusts me. In this case, I’ve spoken with the developers about their love and passion for both Tarantino’s film as well as this little game they’ve poured so much effort into, so to accuse them of not even seeing the movie seems laughable. I mean, these guys came to PAX East with lollipop ears to give away, which is far too clever to go along with any sort of hack project without effort. No, it’s not the prettiest game you’ll ever see, but as is almost always the case with games like this, I beg people to pick up the controller (or get their hands on the mouse and keyboard, as I did in this case) before they start making crass, cynical judgments. 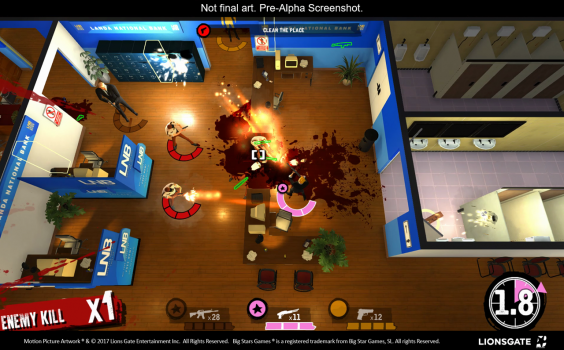 Big Star Games are a tiny 14-person team from Barcelona, Spain, and talking to the two developers they had flown out to PAX East, it’s clear they absolutely love both Reservoir Dogs and developing games in general. Talking about the project, their eyes lit up with enthusiasm; getting directions from them while I was actually playing the game, I could sense simultaneous relief, excitement and anxiety — and I imagine, after working on their title for quite a while and flying it halfway across the world, those feelings are inevitable once they saw other people finally experiencing their work. I mention all this because I think it’s so tempting for people to forget that there are, you know, actual people behind the games they so casually dismiss. 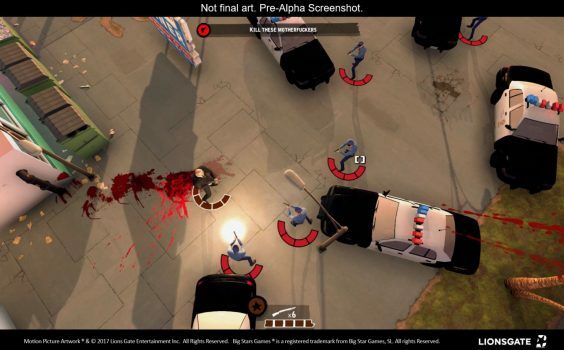 This isn’t a “cash grab,” it’s a labor of love, and I believe that — even if the graphics are simpler at the moment than people might expect — this has the potential to do justice to Tarantino’s classic film while also carving out its own niche as a sort of RTS/top-down shooter blend. The central gimmick behind that genre-bending second bit is a special “time travel” move that sees you rewinding as you switch between characters (and yes, they’re all here, from Mr. Blonde to Mr. Pink). Again, you might think a time travel mechanic would be a weird fit for a Reservoir Dogs game, but it feels like a tribute to the time-bending nature of Tarantino’s early films — Pulp Fiction‘s individual vignettes, of course, are famous for taking place completely out of chronological order. In the same way, the rewinding mechanic I was shown right from the start of Bloody Days got me excited for the possibilities; this is one of those things that can turn a very simple surface idea into something a lot more interesting, deep and complicated. But then that time travel mechanic comes into play. Hit the spacebar, and you rewind to take the next character’s turn, while the former character goes about taking the actions you already performed for him. What sort of possibilities spring forth from this? Well, I realized one quite early on: after accidentally sending one of my characters to die alone in a room full of cops, I had my next character step out ahead of him with round after round of covering fire — changing his fate entirely. That’s just one example, and it’s without the story context that will be present in the full version. Big Star Games say Lionsgate have been monitoring the written dialogue to make sure it stays true to Tarantino’s vision. While I didn’t see a whole lot of it, what I did see was awfully close to the wise-cracking, tough-talking speech of the original, right down to Joe Cabot’s disgusted, impatient directions. Needless to say, I’m looking forward to Reservoir Dogs: Bloody Days, and I hope more gamers are willing to give it a chance — with all the passion and enthusiasm coming from the developers, they deserve our attention at the very least.